Through this revised edition, brand guru Jagdeep Kapoor further strengthens his shaastra that Markets don't decline, they shift. 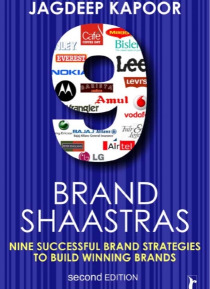 He presents nine key brand strategies which every marketeer must know in order to create healthy brands. Kapoor presents his ideas in a uniquely organised and engaging way, through recent and relevant examples, mapping the entire journey of a brand from inception to succ… ess.9 Brand Shaastras: Nine Successful Brand Strategies to Build Winning Brands discusses key brand building elements such as brand awareness growth strategy and brand market share growth strategy. This easy-to-read book, with its simple frameworks and immensely practical insights is a ';must-have' for all marketing professionals. Besides, it is also an immensely useful tool-kit for business and management students and anyone who wishes to learn the art of successful brand building.